This stainless steel blocker tie ring reduces the risk of injury to your horse or yourself by allowing the horse to pull slack in the lead releasing pressure. The tie ring can be mounted at any height and is made stable by the tongue being held in place. You can now mount the ring on hitch rails. 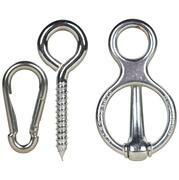 The blocker tie ring is chrome plated and provides a safe and humane way to tie your horse. Rather than a restraint system, it was created to be a support system. When the horse falls or panics, the tie ring allows the horse to pull slack in the lead rope and at the same time releasing pressure and the cause of pain and panic.